There are a lot of myths surrounding vegetarianism—everything from how healthy going vegetarian really is for the human body all the way down to how to make proper meatless substitutions. 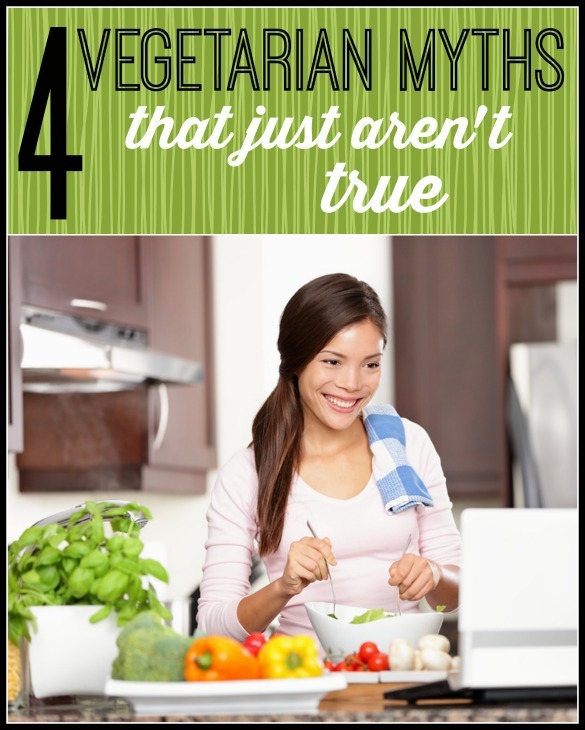 We have organized the most prevalent vegetarian myths out there and are here to set the record straight. With World Vegetarian Day being recognized tomorrow, October 1, we wanted to play devil’s advocate and help inform you about some of the more common untruths about the lifestyle. MYTH: Vegetarians don’t get enough protein. FACT: Protein isn’t only sourced from animals. Protein can be found in plant-based foods like beans, whole grains and vegetables. Some great sources of protein for vegetarians are tempeh, quinoa, almonds, brown rice and pinto beans. Additionally, vegetarian or not, most of us get more protein than we need in a day, so extra effort to add protein to your diet is usually unnecessary. MYTH: Animal protein is healthier than plant protein. FACT: Protein is protein. It was a popular theory for some time that plants are incomplete proteins, which means they need to be combined with other foods to make the protein chain complete. This theory, however, has recently come under scrutiny, with many vegetarians claiming that they are, indeed, complete proteins already. Additionally, when you consume meat for protein, you are also consuming excess saturated fat. While there is room for saturated fat in your diet, eliminating sources that contain large amounts of the artery clogger is encouraged. MYTH: A vegetarian diet is a low-calorie diet. FACT: Many people follow a vegetarian diet as a way to lose weight or reduce calories. Perhaps it’s the term “diet” that makes them treat it as a weight-loss gimmick, but in reality, the word “diet” is the summation of what you eat. This myth is further perpetuated by the idea that vegetarians only eat low-calorie, water-rich fruits and vegetables. While fresh produce is a major part of the vegetarian diet (and should be for everyone), eating any type of food in excess can cause weight gain. A calorie is a calorie in terms of your weight, so even vegetarians must watch their caloric intake. MYTH: All vegetarians are animal-rights activists. FACT: While some people choose to give up meat because they disagree with the way animals are treated and refuse to support animal cruelty, some vegetarians go meatless because they don’t trust the meat industry to supply them with safe meat, believe that a vegetarian diet is healthier for long-term health and/or simply don’t like the taste of meat. The worst thing about being a vegetarian is that so many people who have never even thought about being vegetarians are suddenly experts on your diet. People who I personally see sitting around eating/drinking garbage and almost never touching fruits and veggies feel the urge to comment on the nutrients (they think) I am not getting. Never mind that I track my protein and eat a more balanced diet than anyone I know. Everyone is suddenly an expert when they come in contact with a vegetarian. It is true that most plant sources of protein are “incomplete” in that they don’t have all 9 essential amino acids. Big deal! Last time I checked, vegetarians love grains! Beans + grains = complete protein. If you have a varied enough diet of multiple plant sources of protein, you WILL easily complete your amino needs.